When Jim Marshall, who has died aged 88 of cancer, opened a music store in 1960, his customers included some of rock’n’roll’s most prominent guitarists. They wanted a new type of amplifier. Marshall seized the opportunity and built it for them. His work would earn him the nickname the Father of Loud. Marshall was born in Kensington, west London, to Beatrice and Jim Marshall. Jim Sr owned a fish and chip shop in Southall. Tuberculosis of the bones caused his son to be encased in a plaster cast from his ankles to his armpits during most of his school years. From the age of 13, he took a series of jobs, from builder’s merchant to shoe salesman to baker in a biscuit factory. Medically unfit for military service in the second world war, he taught himself about engineering from books, and in 1946 became a toolmaker at Heston Aircraft, where he stayed for three years. 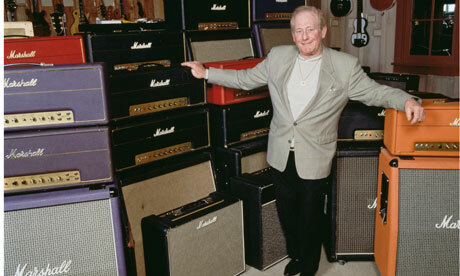 Marshall saved enough money to start his own business, building loudspeaker cabinets for musicians. 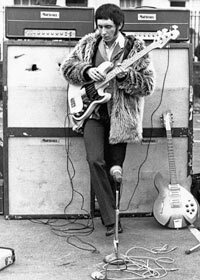 He found an especially keen market among bass players who were fed up with being blotted out by noisy lead guitarists and were looking for some powerful amplification of their own. But after a year of this, he changed tack and opened his own music store in Hanwell, west London, initially specialising in selling drumkits. Apart from Townshend, his guitar-playing customers included Blackmore, soon to find fame with Deep Purple, and the renowned session player Big Jim Sullivan. They told Marshall that they wanted amplifiers with a different sound from the then-popular Fender models, which had a clean but non-raunchy tone. Marshall teamed up with his shop repairman, Ken Bran, and the EMI technician Dudley Craven, and they produced their first amplifier in September 1962. According to Marshall, it was the sixth prototype that gave birth to the powerful and throaty “Marshall sound”. Demand for Marshall amplifiers and matching loudspeaker cabinets steadily increased, and in 1964 the first full-scale factory opened in Hayes, with a staff of 16 making 20 amplifiers a week. The following year Marshall signed a global distribution agreement with the instrument suppliers Rose Morris, though he later felt his progress had been hampered by their uncompetitive pricing policies. However, top musicians were clamouring for Marshall’s amplifiers and their hard-driving sound, including Eric Clapton – for whom Marshall created the “Bluesbreaker” amp-and-speakers combo – and Townshend and John Entwistle of the Who, whose lust for more volume led to the creation of Marshall’s classic 100-watt amplifier. It was at Townshend’s request that Marshall developed the stackable loudspeaker cabinets, or “stacks”, that became a familiar part of the stage scenery for countless bands. Meanwhile, Hendrix bought a package of equipment, plus technical maintenance, from Marshall. Almost everybody who rocked over the next 40 years would use Marshall equipment, from Jeff Beck, the Small Faces and Guns N’ Roses to Pink Floyd, Elton John, Deep Purple, Led Zeppelin, AC/DC, U2, Metallica and Nirvana. In 2003 he was appointed OBE for his services to music and charity. He is survived by his children, Terry and Victoria, and his stepchildren, Paul and Dawn. Just discovered a great blog called Letterheady. I wonder if you can guess what its author fixates upon? 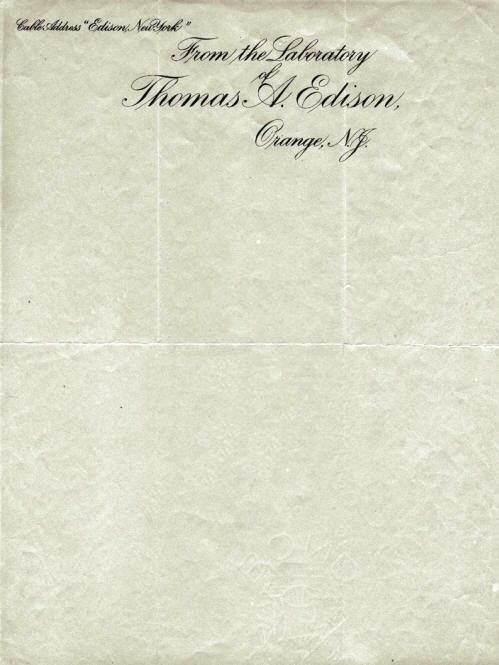 Here’s Thomas Edison’s writing paper from 1923. If anybody has a letter from Edison, please share it with us.